A German court has sentenced a former Nazi army commander to life in prison for his role in the murder of 10 Italians in Tuscany in 1944. After an 11-month trial, the Munich court found 90-year-old Josef Scheungraber guilty of ordering the murder of civilians in Falzano, Tuscany, as a reprisal for attacks by Italian partisans. German-born Scheungraber, who spent decades after World War II as a free man in his hometown in the southern state of Bavaria, had denied the charges. He said he had handed over the individuals in question to the military police. Scheungraber, at the time the commander of Gebirgs-Pionier-Bataillon 818, a mountain infantry battalion, had been charged with 14 counts of murder and one of attempted murder. After two German soldiers were killed in a partisan attack in Cortona in 1944, Nazi troops shot a 74-year-old woman and three men in the street on 26 June, with Allied troops just a few kilometres away. The soldiers then forced 11 boys and men aged between 15 and 66 into the ground floor of a farmhouse which they then blew up. Only the youngest, Gino Massetti, survived, but with serious injuries. Six decades later and an old man himself, Mr Massetti testified during the Italian trial. Scheungraber had been sentenced in absentia in September 2006 to life imprisonment by an Italian military tribunal in La Spezia. The La Spezia court has tried several former Nazis in absentia but none had been brought to justice, with Germany as a rule not extraditing its citizens without their consent. The prosecution had demanded a life sentence for Scheungraber, who had spent the decades since the war running a woodworking shop in the town of Ottobrunn. His defence lawyers called for his acquittal, citing contradictions in witness testimony on the events 65 years on. They said they would appeal the sentence. 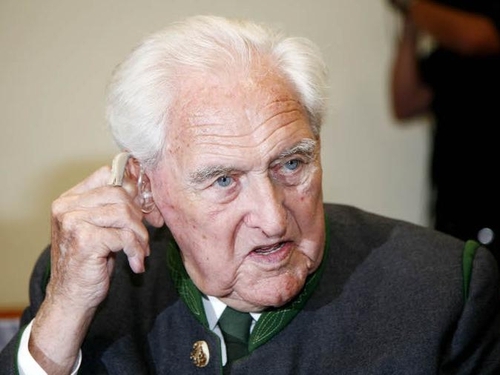 He is expected to be one of the last cases in Germany dealing with atrocities of the Nazi era. One other case pending is that of John Demjanjuk, a 89-year-old Nazi death camp guard deported in May from the US. He has been charged with accessory to the murder of 27,900 Jews.